Oh my goodness I’ve been busy. First of all Charlie and Oscar are back up with me again and as you can understand, I’m not left on my own just too frequently. I must say, they’re lovely boys and they speak to me all the time, but sometimes I don’t have enough room on my beanbag because they like to come and have a snooze with me, either in the study or like this morning, in the kitchen again. Here I am in the kitchen just as Charlie and Oscar came down first thing this morning. 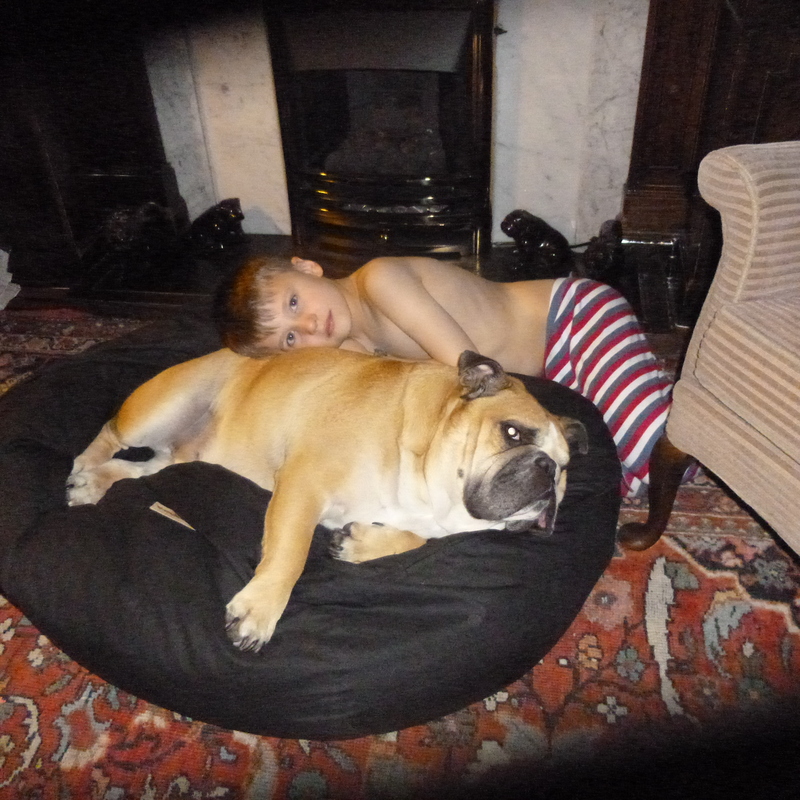 This is my favourite beanbag and here we are once again having a cosy snooze. 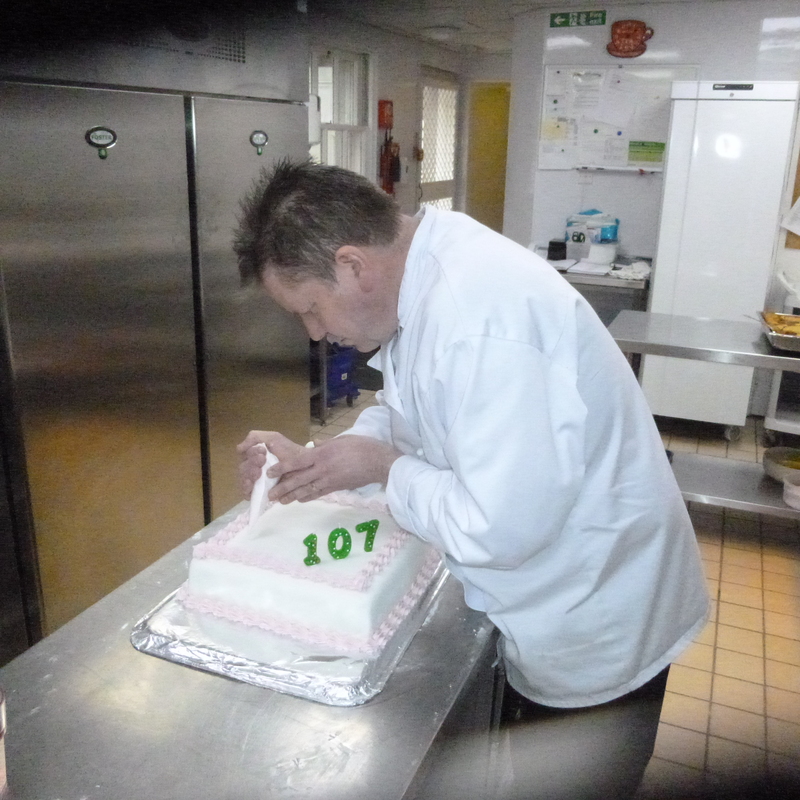 A few days ago, our oldest Resident in Inchmarlo House celebrated her 107th birthday, and as you know I’m not allowed in the kitchen, but I asked Daddy to take a photograph of our Head Chef Colin finishing the birthday cake so I could approve it. It was an absolutely wonderful day and Daddy and I walked all over the Estate and here are some of the photographs we took. Queen Victoria Park looked gorgeous in the spring sunshine. Here’s a shot of our most recent development showing house No 5 Prince Albert Way, with views overlooking the Inchmarlo 9 hole golf course where the weather was such that the golfers were playing in the sunshine. 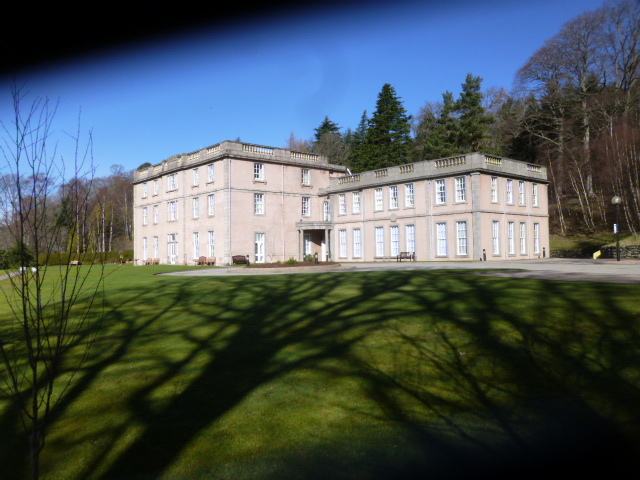 Inchmarlo House in the sunshine. 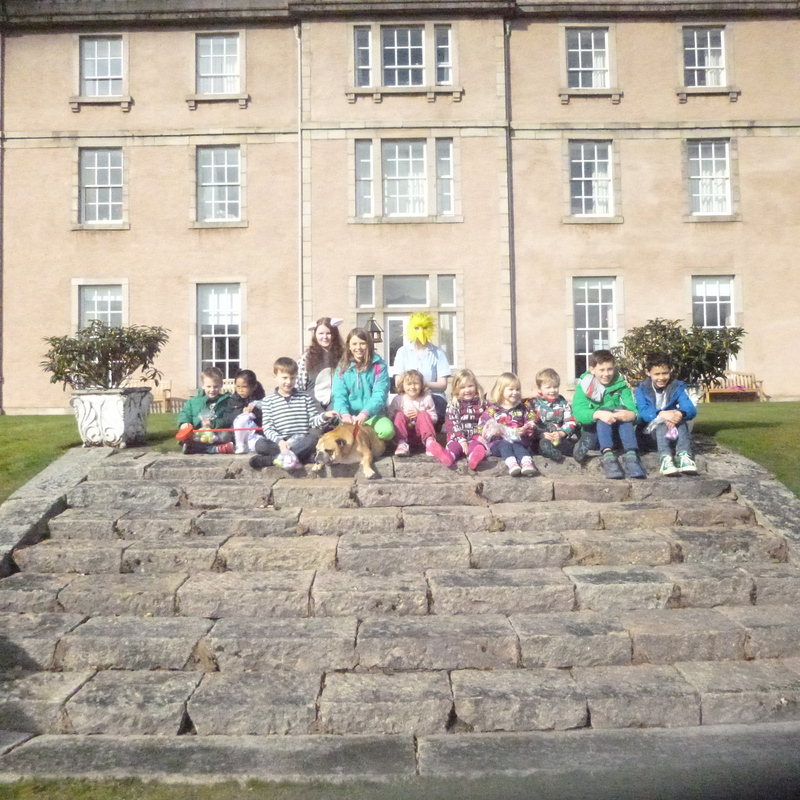 On Sunday the 27th March, we had the Annual Easter Egg Hunt at Inchmarlo. 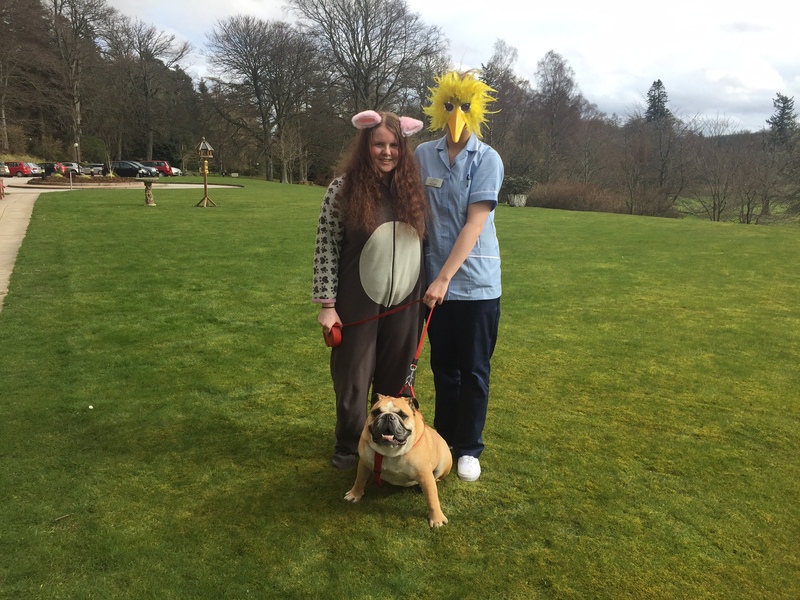 We had a number of children, grandchildren and possibly great grandchildren, as well as some of the staff’s children out to hunt for Easter eggs. I was keen to help them sniff out the eggs, but since they were wrapped in silver paper I couldn’t smell anything! After they found the Easter eggs, they and their parents went inside for tea and cakes. 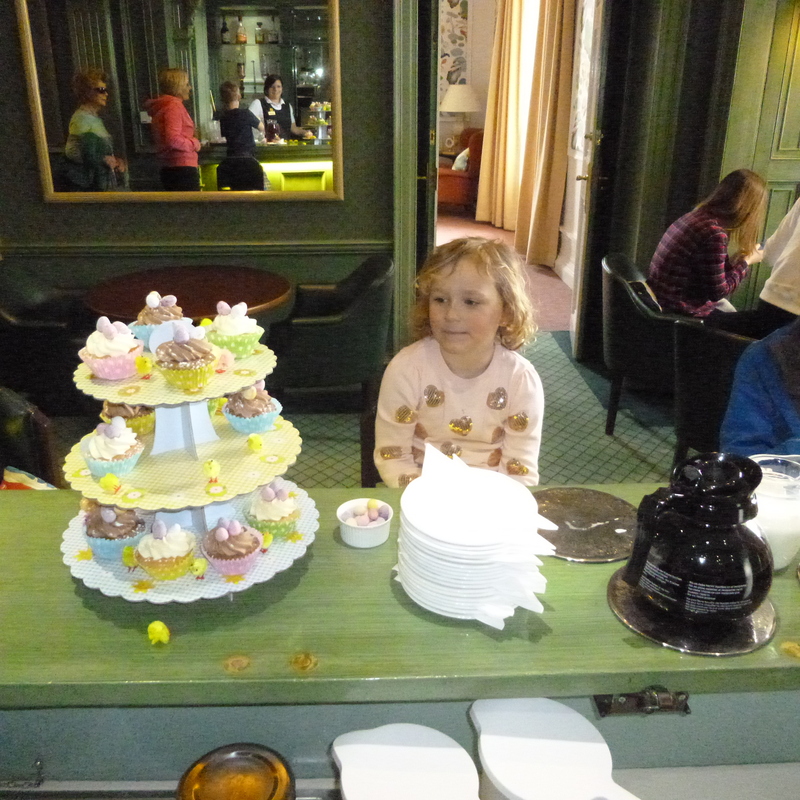 Here’s a photograph of Alex, the daughter of one of the members of staff at Inchmarlo House, trying to work out which cake she would like. Well I’ve had yet another bath and I must say it is not my favourite pastime. I like warmth, and therefore I should like a hot bath more than I do. What I do like though, is being wrapped up in a warm towel and cuddled when I come out of the bath. Sorry, it’s been a while! I have been remiss. I apologise. 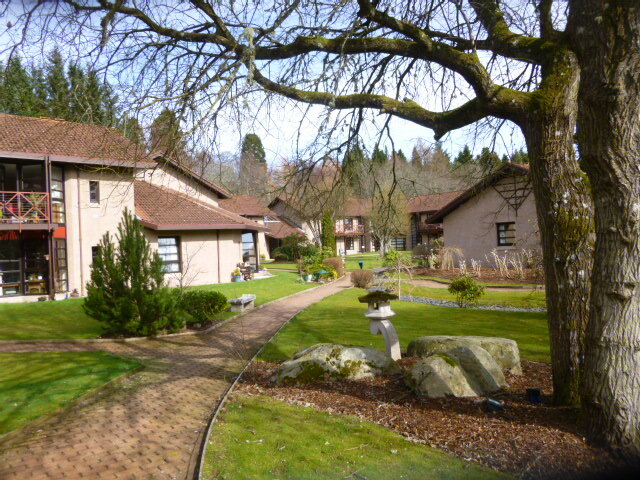 I haven’t kept my blog up to date for some little time now, but that does not mean I haven’t been working at Inchmarlo. 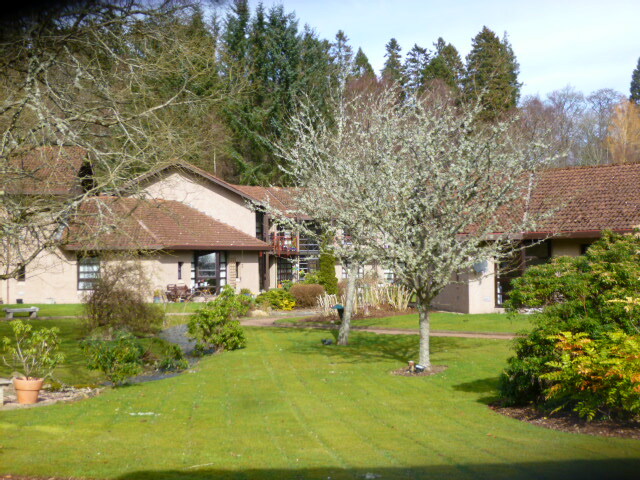 I’m out there at least twice a week, and when I go out there I go in and speak to the Residents in the Care Home and it is absolutely delightful for me to see the way in which I am welcomed by old and new friends. In fact, one Resident who spends quite some time in the Reception area, always asks Daddy if I am with him when he goes out on his own. The weather has been very mixed. Where we have completely avoided the heavy snow they have experienced in other parts of Scotland, we’ve also had some absolutely gorgeous days of sunshine and I have enjoyed walking around the neighbourhoods, including our next neighbourhood of Pinecrest which has started building. I’ve been unable to get into the houses to supervise it because a lot of the floors are not complete and Daddy doesn’t want me to stand on any tacks or nails that might be lying around. So here I am having my first inspection, albeit from outside. The layout of the houses are almost the same as those at Prince Albert Way, except at my suggestion, the study has been made larger so it can be a third bedroom or a nice room for a pet like me. Keeping a close eye on the work so far. On Saturday Mummy, Daddy and I went down to the beach in Aberdeen and by goodness, it was absolutely perishing – beautiful sunshine but freezing and Daddy said it felt like being on top of the mountains in St Moritz! But what an interesting day, we were walking along the boulevard and came across a couple with a Bulldog called Raymond, so he and I had a good sniff of each other. He was much younger than me, but like me delightful to meet! I love the beach because there are so many people walking their dogs and I go and speak to them, and also young children on little scooters and they either come over and smile when they see me or, alternatively, go and run behind their Mummy or Daddy. 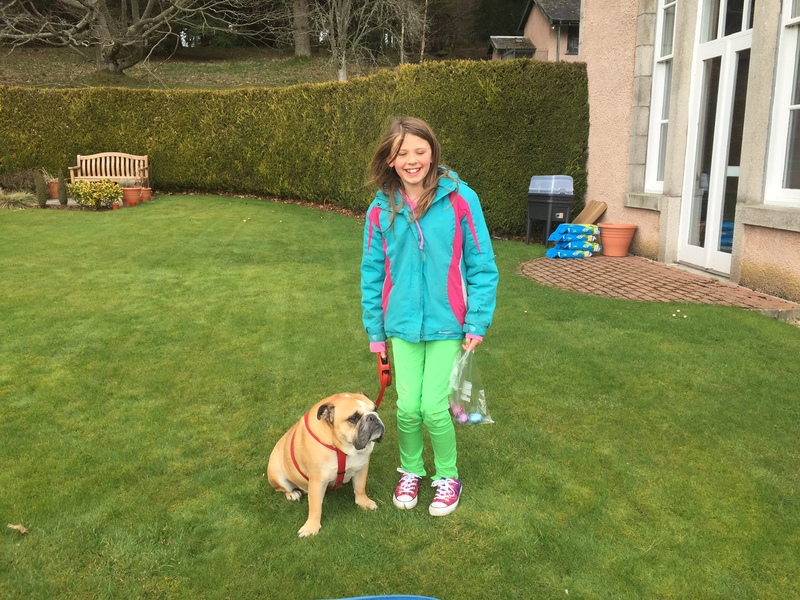 On Sunday we went to Hazelhead Park, it was another gorgeous day and lo and behold, as we were walking around we came across another Bulldog called Vinny. 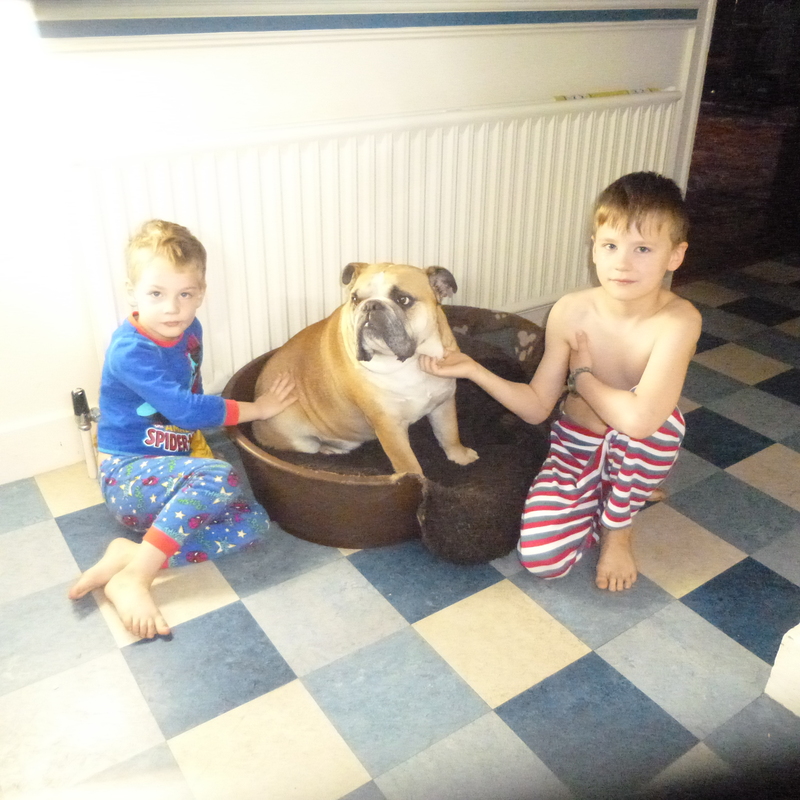 Mummy took a photograph of the two of us together and he barked at me a couple of times which was very unusual for a Bulldog. Maybe he was having a bad hair day which we all have sometimes! That’s Vinny on the left.